Rate this Article With the insane popularity that augmented reality game, Pokemon GO, has garnered, we thought that it is possible to use this popularity to predict the future of AR-based games. Let's take a look at how Pokemon Go has changed the AR industry and how will it change the industry's future? A lot of people today grew up with an animated TV series launched way back in the 1990’s. As with the best animations, Pokemon originated from Japan but evolved throughout the years as a global phenomenon in the field of animation. Originally for kids, somehow it stuck with them and the Otaku generation has all grown to adulthood with Pokemon in the form of video games, printed materials, mobile apps and other media forms that continually cater to ones lingering childhood. Today, Pokemon is back with a vengeance in the form of an augmented reality mobile game called Pokemon GO. In its simplest definition, Augmented Reality is the process of projecting or overlaying digital images and information onto the real world. It’s not really there but you can see it provided you have the right equipment to see it. That would be your smart phone, VR/AR smart phone loaded headset or a specialized AR visor. With these, you see the real world with all the things the app wants you to see and interact with them using the devices mentioned. Pokemon Go is an application of Augmented Reality where you have to go around an area (in the real world) that is provided by the service. The game uses your smart phone running the app and combines client-server networking and satellite tracking to pin-point locations you have to go to in order to see a Pokemon on your device which you have to catch. The game acts just like a standard Pokemon videogame with miscellaneous and important items like Pokemon eggs, incubators, stardust, trap balls and everything that has to do with locating, catching and training your virtual pets to do battle against other trainers or to hold a certain location for your team. However, all the traveling is done in the real world and in such an immersive way, thus combining the virtual aspects of the game with reality itself. Once the location is reached, the Pokemon appears on the phone which is used by the gamer to throw a Pokemon ball and catch it. 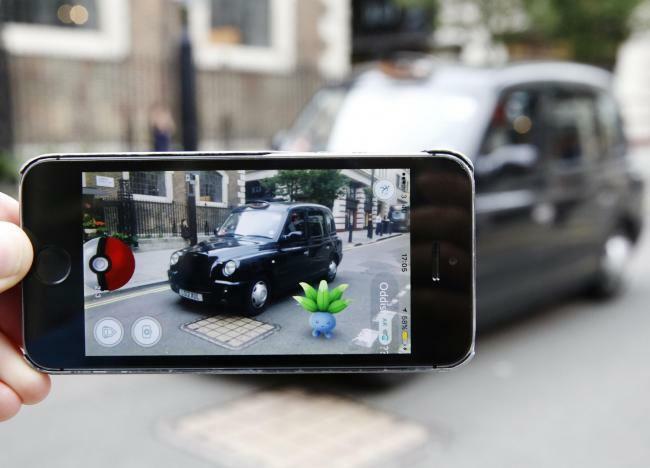 Pokemon Go is one example of an Augmented Reality application. The technology itself can be used though for dozens of other things and not just games. However, for AR, augmented is the word and its future is in reality itself. Unlike Virtual Reality (VR) where the user is immersed in a simulated environment and cut-off from reality, AR does not leave reality at all. You can still see your current surroundings although virtual information has been added to it. In a way, AR replaces holograms as the images or information is projected on the device that one is wearing rather onto thin air. That way you won’t need R2D2 to play out Princess Lea’s message as you will see her on your AR visor instead. Just don’t forget to pass the AR device to Ben Kenobi so he can see her too. Simply stated, the future of Augmented Reality is in applications where the user needs to view virtual digital information without leaving the real world. Combining it with VR information or switching back and forth when needed is a great way to view the possibilities of AR. Let’s take a look at a few instances. You have to view virtual information and travel at the same time in the real world. Whether you are driving a vehicle or walking down the street you will need to see where you are going, what you are stepping-on, the people or objects coming your way or you simply have to talk with your companion and share with him the information while staring at his ugly face. You can’t do that via VR as everything would be simulated in there. What if there’s a glitch and it doesn’t show the banana peeling right in front of your path? Technical maintenance and repair is another application worth mentioning. Whether civilian or military, machines like vehicles or electronic instrumentation may require technical diagrams in order to perform efficient troubleshooting to fix the problem. A technical sergeant may need to align the gyro circuits on a fighter jet on the field at such short notice. A mechanic may need to repair an automobile and need engine schematics while stuck in a traffic jam. Anything requiring information and simulation in real time is an application for Augmented Reality. Just as being in a simulated VR world have both its pros and cons, Augmented Reality is a medium that goes beyond entertainment. It may not be able to do everything but the future holds a lot in applying it to our everyday lives. After all, AR is already a combination of the virtual world with reality itself.